We are a bunch of musicians trying to express our own feelings into our music. 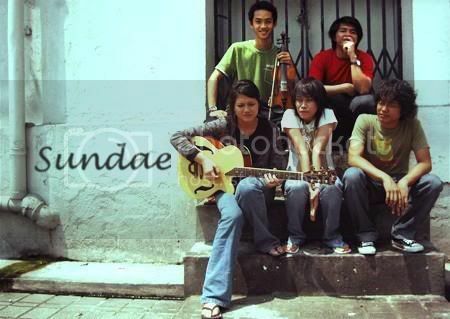 The 5 of us got together around Feb 2008 started this crazy idea of having a band coz we love music so much. It all started when Anis show some of her ideas to Zul on a CD. Zul thinks they sounded really good and he went around and told his friends (Apple, Azam & Umar) about this. Then 1 day, they all sit in a room and start talking about music. Hearing themselves sharing the same thoughts, they fell really close and think they could share more with each other. And that is when they talked about forming a band. The name SUNDAE, came when we were looking for a short name that would symbolized us. Apple, her talent really shows went she was able to come up with the some chords and lyrics. The band was really amazed and they went to jam and worked on her ideas. Umar on the other side, was a really good gamelan player but somehow he got his way easily on any instrument too. The sound of violin and melodion really make us sounding more different in a musical way. Azam, is a very friendly person is really into percussion. With his touch, we got the groove. Music made us feel really comfortable and we would like to share this emotion with all the people. halo geng style la korang ambik gambo..mmg clasic.lagu pun best.weh kalu kita invite gig kt penang korang nak minta brp?? ?